Alia Bhatt was asked to comment on the 'announcement' she made by saying 'I love you' to Ranbir Kapoor at the recently held Filmfare awards and this is what she said. 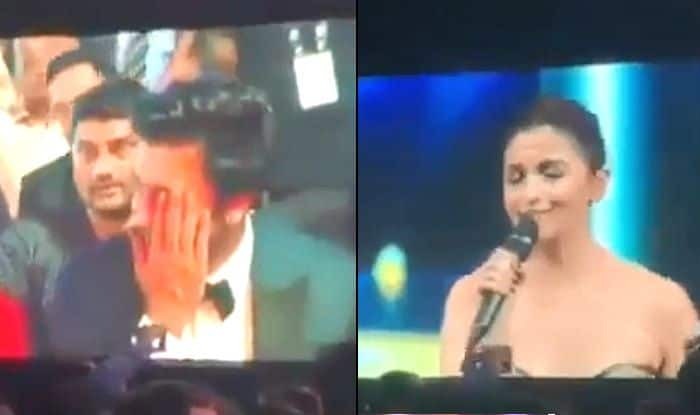 Actor Alia Bhatt raised eyebrows when she said ‘I love you’ to Ranbir Kapoor at the recently held Filmfare Awards. However, she doesn’t think of it as an ‘announcement’ of her relationship. The actor has been promoting her upcoming film, Kalank, in the media and during one promotional interaction, she was asked to comment on what she did at the award ceremony. Neither Ranbir nor she herself has ever openly talked about their brewing romance. Both of them are seen together at film events and make sure they are there to support each other at film screenings. In fact, they are also equally involved with each other’s families. While Alia keeps paying regular visits to Ranbir’s ailing father Rishi Kapoor in New York, the actor plans her birthday party with her family members. Everything does seem hunky-dory and speaks volume of the lovely chemistry they share. However, this doesn’t mean they are ready to talk about anything personal in the media. On the work front, Alia’s next big period drama, Kalank is hitting the theatres on April 17. She has got Brahmastra with Ranbir Kapoor releasing at the end of the year. The actor has bagged two more biggies – Inshallah with Sanjay Leela Bhansali and RRR with SS Rajamouli apart from Takht with Karan Johar. There were also the rumours of Alia starring the biopic of mountaineer Arunima Sinha, however, the actor denied signing the film. She told the daily that talks are on for more films but only the announced ones have been confirmed from her side.